Developer(s): Attention to Detail, Ltd.
Pack-in games are actually an interesting group to study. I’m talking about games bundled with the initial release of a console, which in doing so are the first games released for the system. It’s pretty much a guarantee that everyone who buys the console will play the included game, and they’re interesting because, since these games will make the console’s first impression, they are always carefully considered. This screening process, probably done in a small boardroom with whiteboards, means that all pack-in games carry a similar set of traits. They’re almost always an original brand. They always display new graphic capabilities of the new hardware in a “showy” manner that will look good in magazines and store displays. They’re frequently of a medium length; long enough to last for at least a few weeks, but obviously not the last game you’ll ever need to buy. They’re always based on simple, pick-up-and-play concepts that can appeal to a broad audience. Each of these fits Cybermorph to the letter. So as the world’s first introduction to the Jaguar, how does it fare? Above all, it looks pretty good. 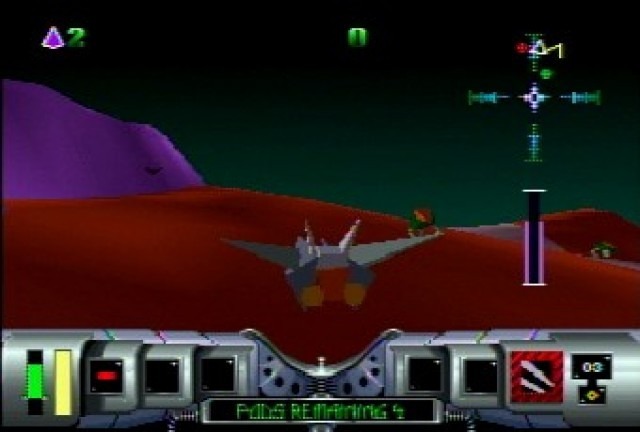 I suppose the best console comparison from that period would be StarFox – undoubtedly an impressive game, but one locked to a single path with flat, suggested terrain. Cybermorph removes these restrictions. You have over 28 unique planets to explore, all open to free-form flight across their polygonal hills and dales. You can roar over the ground and dip down to attack tanks and turrets, you can dodge fighters by weaving between trees and buildings, you can open up the throttle and scout out the land from a reasonably safe altitude. It’s a different kind of shooter than those before it, because it opens you up to play in your own style inside small sandbox worlds. The polygons are few and untextured, but do manage some shading in relation to a fixed sun/light source. The overall speed of the engine is noteworthy too, zipping along fast and smooth. This is a game that couldn’t have been done on competing or earlier console hardware, and was past the level of similar PC titles from that time, like the original DOS version of X-Wing (which had the ships, but no terrain). As far as heralding the beginning of the 64-bit era and encouraging you to “Do The Math,” Cybermorph gave Atari a good start. You play as a pilot whose nation is locked in a technological war with the evil Pernitia Empire. Pernitia has stolen most of your side’s research and locked the pieces inside yellow pods scattered around various planets. You drive a prototype ship called a Transmogriffin which can change shape to accommodate various speeds, and to arm a variety of weapon pods you find and collect along the way. Pretty standard space shooter stuff. The plot won’t win any awards, and it’s a generic explanation for a scavenger hunt, but the gameplay will certainly pick up the tab. The game is grouped into galaxies of nine planets each. You travel to eight of them in any order, selecting your target from a menu screen based on information like total number of pods and number you’re required to rescue. Extra pods over the catch limit result in 5000 bonus points a piece. Weapons carry over between planets while all ship damage is repaired between levels. After clearing out all eight planets, you’ll automatically travel to the ninth hidden planet and fight a boss. Success takes you to a new galaxy, and gives you a four-digit password (you type it in with the numpad – nice!) to return to that galaxy at any time. That little yellow pod represents decades of my race’s research. Planets are generally wide-open, and rotate in relation to your travel. If you fly in one direction long enough, you’ll return to your point of origin. You’re only limited by your altitude, allowing for some planets consisting entirely of canyons, or areas blocked off by mountains and accessible only by flying through teleporters. Your only mission across all planets is finding and collecting a specific number of pods for that planet. The rest of the game’s content is designed to prevent you from doing this easily. Enemies and defenses litter the planets in varying numbers and strengths. Lone pods appear on your radar, but most are hidden by “pod prisons” which you must visually discover and shoot open. Pods cannot be destroyed by regular enemies, but they can be erased by stationary “vortex towers.” Flying crane units pick up the pods and deliver them directly to the tower. If you lose more pods than your goal for that mission, you’ll fail and have to restart that planet. The planet menu will list how many of these towers are present, which roughly acts as your only time limit. More towers obviously destroy more pods faster. If a planet is tower-free (and many are) you only have to worry about staying alive long enough to find all the hidden pods spread out along the surface. There’s a variety of enemies to stand in your way. You have ground units and turrets that shoot surprisingly massive groups of speedy polygon missiles. These can apply a lot of hurt, and are best avoided. You have various flying drones from small, hard-to-hit fighters to nimble kamikaze ships. 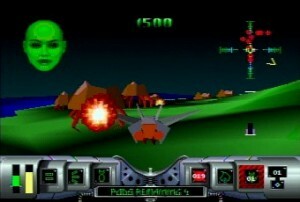 You have a number of creative enemies and emplacements, such as the green patrol drones that circle over pods in some levels. If you engage them, they’ll fire volleys that will make you weep. If you swoop past them and nab the pod, you can zip out of there before they can react. 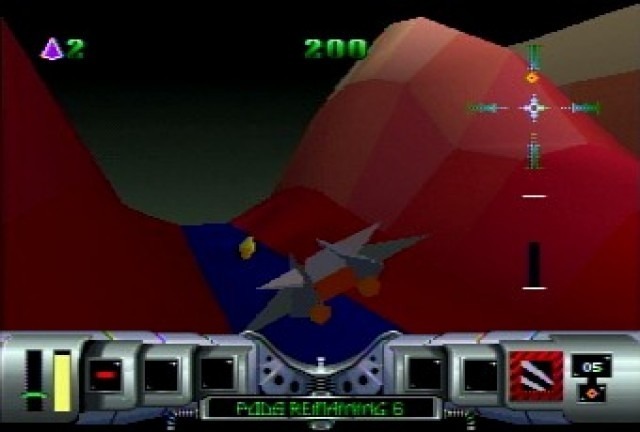 Groups of tiny fighters can easily swarm and overwhelm you, but if you can locate a radar tower you can destroy it to freeze them all in place. These are nice touches that gives each enemy a different “personality” and a different way to beat them. Tankers and support craft also fly around, and can be shot down to retrieve their cargo. Everyone you see may not be a direct threat to you, but they all can be destroyed with impunity. There are no innocents in the Pernitia Empire. The most interesting part of the game is the detail the team has managed to squeeze out of the limited pieces they’ve been given. Only a handful of rainbow colors are used for terrain. Grays and blacks make up most ships. Triangle polygons are the building blocks, and basic shapes, of most craft in the game. Your altitude limits terrain to small rises, medium hills, and impassible mountains. The engine cannot carve down into the planet, only raise it up above sea level. That’s about it, but like a skilled artist, or a creative visualizer with only a basic set of Legos to work with, they manage to make each planet unique. Ice planets, metropolises, giant lakes, canyons, barren deserts – two planets back-to-back are never the same, and the most criticism that you can level is that you’re encountering another “class” of planet like another ice planet. They still seem distinct, and open themselves up to different gameplay challenges. Small details are even apparent that open up your imagination. A row of beachfront property suggests the lives of the inhabitants. A spinning triangle poly atop a flying crane suggests a radar scanning for the opportunity to beat you to another pod. Gray textures on the ground suggest roads to follow to complexes and the like. Controls are easy to execute, and give you an appropriate amount of control over your T-Griffon. The D-pad navigates, one button accelerates, one fires, one brakes/reverses (these are customizable). Accelerating sets the speed of your craft and does not need to be held down, same with braking. Your T-Griffon will morph itself briefly to direct its thrust based on your control; a neat effect and one that’s done smoothly, but not really needed. Option cycles through your standard weapons, including a semi-auto cannon with dual and tri-shot powerups, missiles, mines, and a flamethrower. Everything but the default weapon comes with limited supplies, tracked clearly on your dashboard. There’s a single superweapon slot triggered with any of the top three numpad buttons. These are very limited and quite powerful, so their placement on the numpad strikes the right balance of easy access and ensuring intent to fire. The rest of the numpad goes to a variety of external views for quick looking. Their placement is too clumsy to access in quick combat, and doesn’t help you much in the heat of battle. If you know craft are tailing you and shooting, you don’t need to look back to make sure. These views are useful though. As you increase in speed, turns become sharper and harder to control (replicating the open throttle). It’s easy to lose control and slam into mountains this way, so I preferred to set a constant speed and look left or right for pods instead of turning the entire craft. This is reasonably safe as you craft defaults to hover mode and cannot crash into the ground. Just make sure you’re not looking around when you’re rocketing toward a mountain, but then that’s just common sense. Right now Skylar is likely inquiring where I learned to fly. The only music in the game is in the intro, and it’s a pretty catchy little tune. Your ship comes equipped with a bald AI named Skylar who exists solely to nag at you. The voice is digitized, clear, and impressive, but the words are not. “Ouch” and “Where did YOU learn to fly?” are the highlights, as well as a occasional “Good Job” when you shoot an enemy. It’s monotone, but I can hear the sarcasm. I hear it Skylar. Other effects punctuate the silence of the levels or the variable droning of your engine with nice blasts, thuds, and cracks. About the only effect I’m not clear about is a loud “gulp”ing noise when your ship collects a powerup, as if eating it. That suggests more about the T-Griffon’s operation that I want to know. The only real complaint I have about the entire game is the lack of a map. Your radar can point out unshielded pods, which I agree is too easy for the entire game. The pod prisons are a nice way to handle this, and I don’t mind searching for them. I do mind getting lost or flying circles around a nest of hidden pods because I can’t see that I haven’t flown over them. There’s no compass indicator or a true north – some objects like vortex towers are tracked with an arrow on the radar and could be used for reference, except that once you fly over the “seam” connecting the world then the arrow at your back flips to in front of you. It makes it impossible to use as a constant. You instead must rely on landmarks to guide a patterned search, which still result in missed areas. You’re especially out of luck if you have no landmarks, like when you’re flying over a giant lake. I agree that something more difficult should be done than just having the radar lead you to every single pod, but these endless searches for the last pod are hands-down the most frustrating part of the game. Some heavy draw-in doesn’t help your search either as you can’t see at great distances. The worlds are small enough that this isn’t a gamebreaker, but a map would have been nice. 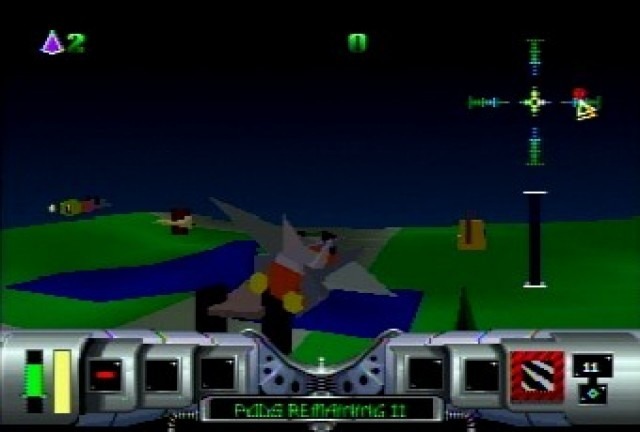 So Cybermorph fills the requirements of a pack-in game with flying aplomb. It looks cool in a Babbages display window. Anyone can play it. It’s a game you had to buy a Jaguar to play, and not just because it’s an exclusive. It’s a blast to play through to finish. And when you’re finished, you’ll be ready to head out to store to see what else the Jaguar can do. Strong introduction to the Jaguar. Easy, lasting gameplay. The scavenger hunt is old, the freedom to pursue it the way you want to is quite new. Navigation can be difficult. All planets are some variant of “collect the pod” gameplay. Few reasons to return once its beaten, especially with other titles waiting. Not a bad game. The graphics have not held up well over the years, but it’s fun enough to fly around and explore the many world’s in the game.